I’ve made Operas before on this blog and whilst I love how they look, I’m not a very big fan of coffee and chocolate, so I thought I would make an alternative flavoured Opera. I really enjoy good beer and I mentioned a little while ago that I wanted to experiment more with different ingredients on the blog. When I came across a William Curley recipe for Guinness and blackcurrant truffles I was inspired to create a cake using these flavours. I didn’t want to use Guinness as I think there are much better examples of stout available. So I chose a bottle of Stout by Partizan Brewery, they make some fantastic beers and this 8.2% flavoursome beer worked perfectly. The Salted Caramel element came about because I love salted caramel and because the sweet saltiness works perfectly with the earthy richness of the stout and blackcurrant. 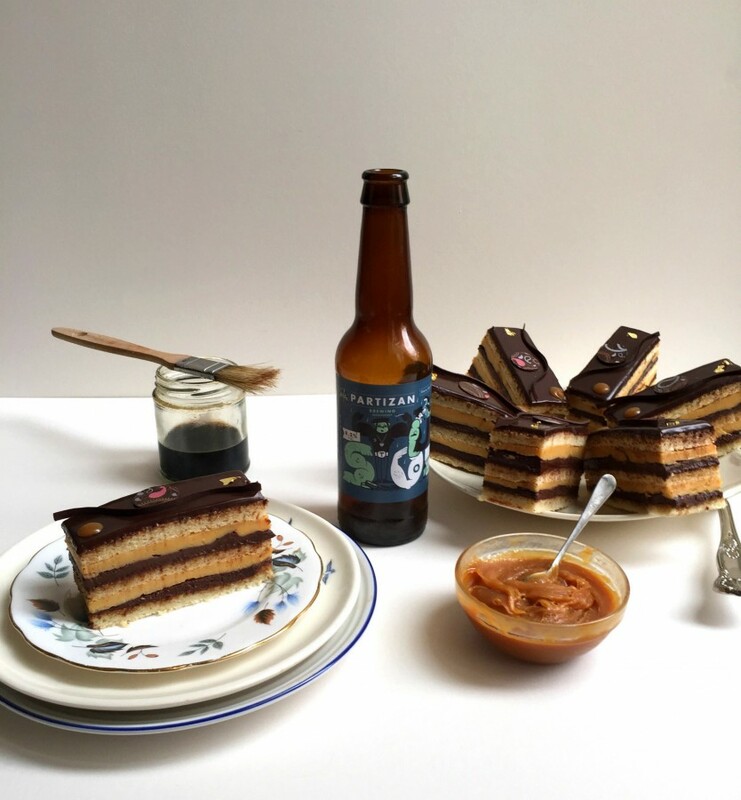 William Curley is a huge influence of mine and the Opera in his book Patisserie was used to devise this Stout & Salted Caramel Opera recipe. One of the great things about this recipe is that so many of the components can be made in advance and you don’t need a cake frame to make this Opera or to freeze the finished cake. All of the elements are robust enough for the cake to support itself, so this means you really don’t need any special equipment to make this cake, apart from a stepped palette knife and a sugar thermometer. 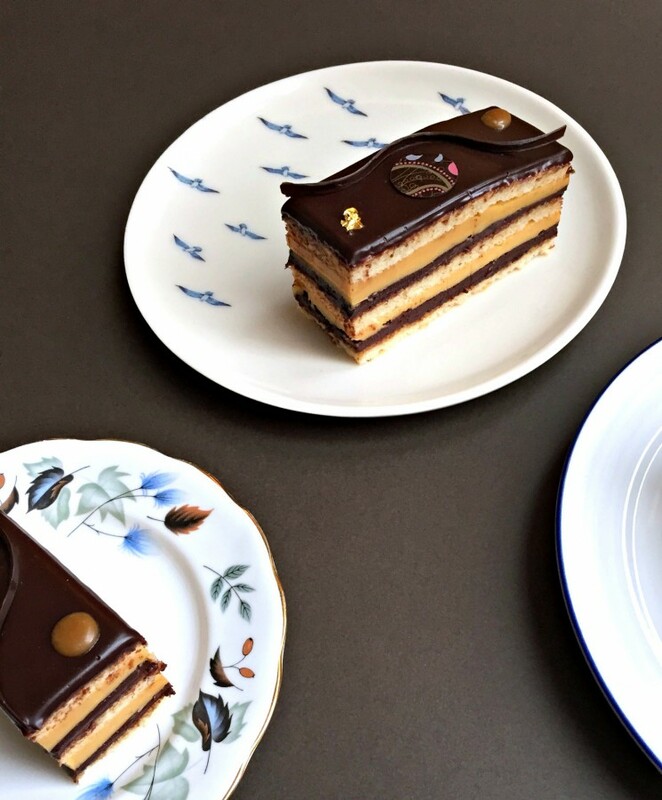 The Opera cake is steeped in history and it’s traditionally made up of layers of ganache, creme au beurre and biscuit Joconde, finished off with a dark chocolate glaze. 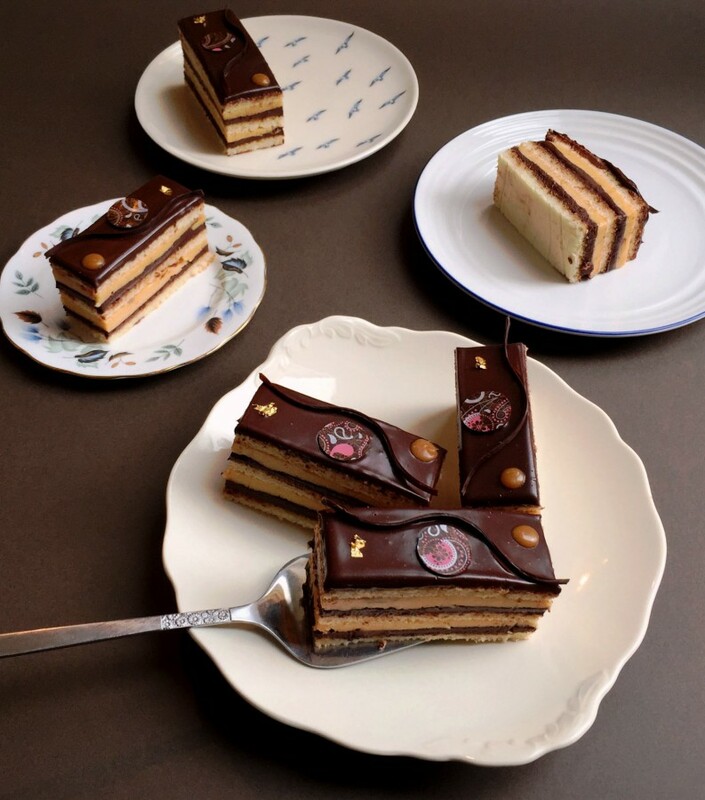 La Joconde is another name for The Mona Lisa and the reason the biscuit Joconde is named after the Mona Lisa is because this versatile cake is held in such high esteem. The Opera was first devised by Patisserie House Dalloyau in 1955 and it continues to be a classic up to this day. The recipe below might look daunting, but each part can be tackled separately and this delicious cake really is worth giving a try, I decorated the cake with chocolate waves, discs of chocolate with chocolate transfers on them, some of the reserved caramel and a sprinkle of gold leaf in honour of William Curley. Heat the sugar until it turns a golden colour. Turn the heat down to low and add the cream in small batches. Take care as the mixture will bubble up, so you will need to stir quite quickly. Pour into a bowl, cover with cling-film and leave to chill. Break the chocolate into pieces and place it in a medium sized bowl, cut the butter into cubes and put it in a separate bowl. Place the whipping cream, muscovado sugar, blackcurrant puree and stout in a saucepan and heat until it comes to a boil and the sugar has dissolved. Remove the pan from the heat. Pour the hot liquid over the chocolate and stir gently until all of the chocolate has melted, then add the butter and stir gently until all melted. The ganache will seem quite runny, but it will set to a silky smooth ganache that is perfect for spreading. Place all the ingredients in a saucepan and bring to a boil, continue to cook for a few minutes, then leave the syrup in the pan to cool. Remove the piece of lemon and store in a jar or airtight container. Put the cream, sugar and liquid glucose in a saucepan and bring it to the boil. Add the hot cream mixture to the chopped chocolate, mixing until the chocolate melts and the ingredients come together. Pour into an airtight container and cover with cling-film, pressing to the surface of the glaze so that condensation or a skin doesn't form. When cool place the glaze in the fridge and use within 4 days. Put the caster sugar and water in a saucepan, bring to the boil and heat to 121C. Put the egg yolks in the bowl of an electric mixer and whisk, slowly pour in the hot syrup and whisk until thick and cool. Gradually add the softened butter while still whisking. When all of the butter has been incorporated, continue to beat until light and aerated. Add the salted caramel and beat until fully incorporated. Preheat the oven to 200C and line 3 baking trays that are at least 24cm x 30cm (it doesn't matter if they're a little bit bigger as you will trim the finished cake). 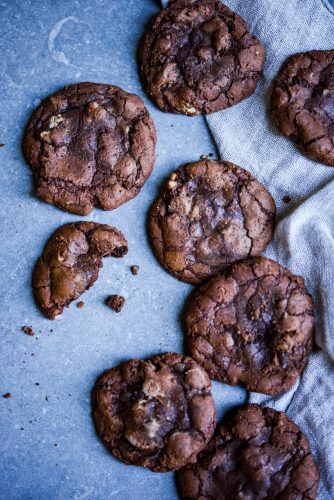 Put the sifted icing sugar, ground almonds and sifted flour in a large mixing bowl, add the eggs and beat until the mixture is light and pale. Melt the butter gently, do not let it boil or simmer, add the melted butter to the egg mixture and beat until it is fully mixed in. Put the egg whites and caster sugar in the bowl of a stand mixer and whisk until at firm peaks stage. 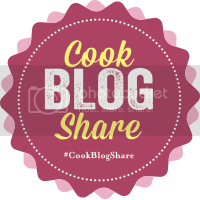 Fold the meringue into the egg mixture until fully mixed, weigh the cake mixture (the easiest way to do this is to tip the mixture back into the bowl of the mixer and weigh it) and then split it between the 3 baking sheets. Bake in the preheated oven for 12-15 minutes until golden brown and the sponge springs back when pressed gently. The individual components of the Opera can be made over a few days or in advance. - Salted Caramel: This will last for 2-3 weeks stored in an airtight container or sterilized jar. 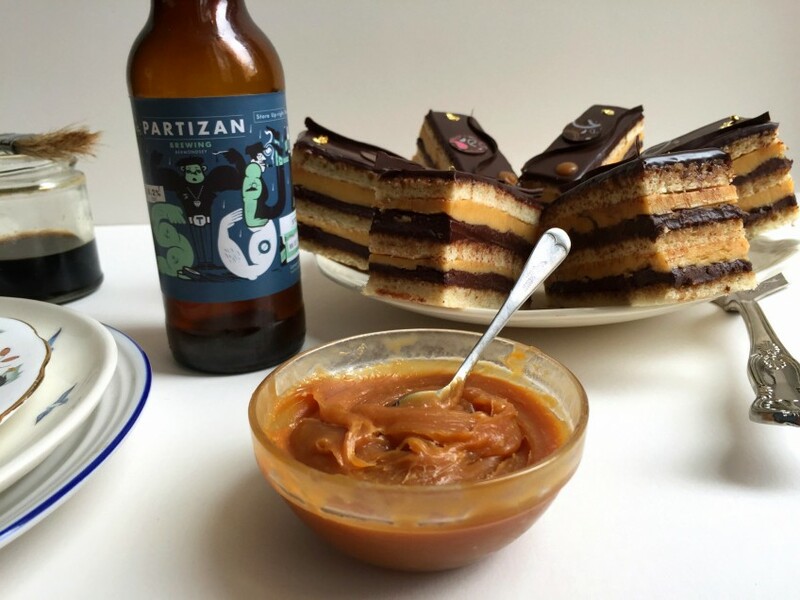 - Salted Caramel Creme au Beurre: This will last for 3-4 days in the fridge, or can be frozen for up to a month, just defrost overnight in the fridge and then beat with an electric whisk to lighten. - Biscuit Joconde: Can be frozen for 1 month, if not freezing, it must be used on the same day as baking. - Stout Syrup: Can be stored in an airtight container for up to a week. 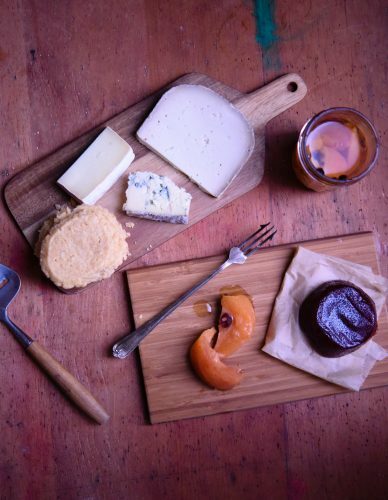 - Dark Chocolate Ganache Glaze: Stored in an airtight container in the fridge for up to 4 days, reheat gently to use. - Stout and Blackcurrant Ganache: Stored in an airtight container this will keep for 7 days somewhere cool or stored in the fridge. Before you start, make sure all of your ingredients are cool or at room temperature, give the creme au beurre a whisk to make sure it's velvety and smooth or use it straight after you've made it. 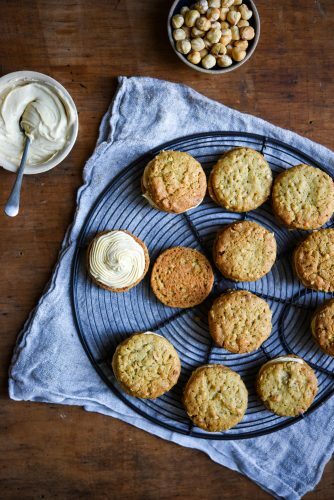 Cut your three sponge cakes down to 20cm by 26cm and place one of the sponges on the greaseproof paper you cooked it on and then place this on top of a chopping board or any surface that the whole cake can fit on and be transported into the fridge. Also make sure you have space in the fridge for the cake to fit. Brush the sponge cake with the stout syrup until the top layer is covered. Spoon 300g of stout and blackcurrant ganache on top of the sponge cake and spread it out evenly. Put the cake in the fridge and rest it for 20 minutes. Weigh 300g of creme au beurre out and spread it evenly over the ganache. Place a second sponge on top and brush the sponge with the stout syrup. Spoon the rest of the ganache on top of the sponge and spread it out evenly. Return the cake to the fridge for 20 minutes. Spread the remaining creme au beurre on top of the ganache and place the final sponge cake on top. Brush the sponge with stout syrup and leave to set in the fridge for an hour and a half. Warm the glaze gently in the microwave or on the hob until it reaches 30C, take the Opera from the fridge and pour half to two thirds of the glaze over the top (you probably wont need all of it) until it is covered evenly. Place the Opera back in the fridge for 10 minutes to set. Prepare a jug full of hot water and dip a long knife into the water to warm it. You will also need a towel or kitchen roll to wipe the knife after each cut. Take the Opera from the fridge and dry off the warmed knife with the towel. Trim the four edges of the Opera to neaten it up. Making sure to clean the knife in the water and wipe it dry with the towel after each cut. Be sure to slice downwards and pull the trimmed edges away from the cake, do not saw with the knife, or pull it up or through the cake, this will mess up your lovely layers. Then cleaning the knife between cuts, divide your cake into portions, I managed to get 12 portions. place these on a tray/plate and decorate however you wish with tempered chocolate decorations, gold leaf, reserved salted caramel or fruit. Are there any classic flavour combinations that you don’t really enjoy? 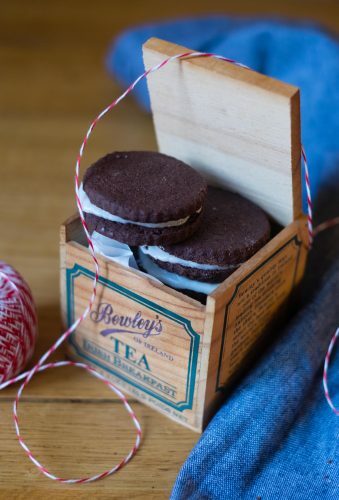 Or perhaps you have an idea for an Opera cake flavour that you think might work. This looks absolutely amazing. Your instructions are so well written as well that I am very tempted to give this a try for a supperclub that we are doing in May, if I do I will make sure I let you know! Good luck if you try it Michelle. It’s a really delicious cake. Let me know how you get on. Going to try this! Wish me luck. Fiona I’ve only just this! I’m so sorry, did you make it? I hope it went well. I love baking with beer, it’s so much fun. The results can be really varied too, as there are so many great types of beers. That is a great beer and they make lots of other delicious ones. Thank you! I loved making this, so your kind comments mean so much to me. I’m glad you like the look of it! This is such a difficult cake to master and you have made it to perfection: from your perfect layers to the amazing shiny ganache on top. Makes me think I am back in Paris looking in a patisserie window. Well done! Oh wow thank you so much Luca. I’m glad you like they look of it, such wonderful compliments, I can’t believe you think it looks good enough to put in a window for sale! Thank you! Thanks so much Dominic, I was really pleased with how this cake turned out. It tastes so delicious, I will definitely be providing more bakes to Simply Eggcellent in the future. Thanks for commenting. How can you not like the combination of coffee and chocolate. They’re my favourite! This cake is so beautiful, you have such amazing attention to detail. I love the decoration. I always look forward to seeing what amazing creation you’re going to come up with each week. Well I do like coffee and chocolate, but not really in an Opera so much. Thank you for the comments on the decoration, it’s hard to rain it in sometimes, less is definitely more. 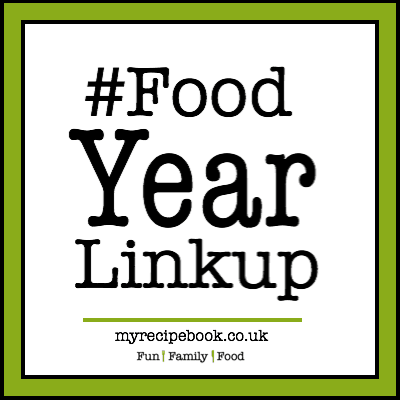 Thanks for writing such lovely things Charlotte and thanks for #FoodYearLinkup. Amazing and incredibly skilled. I’m sure they are an absolute delight to eat. Oh Julie they are so delicious. I’ve just polished off a slice now. They’re rich, but due to their size, it’s just right. Thanks for the kind comments about the look of them. Thanks Hannah, it’s all in the knife, I have a really good pastry knife that makes the cutting really easy. Then you just clean the knife between cuts and warm the knife. The blackcurrant puree really enhanced the stout flavour, so it works really well. The flavour combination works so well. Thank you for commenting. Wow! What an amazing combination. The icing and the layers look perfect by the way. Thank you so much Luca. 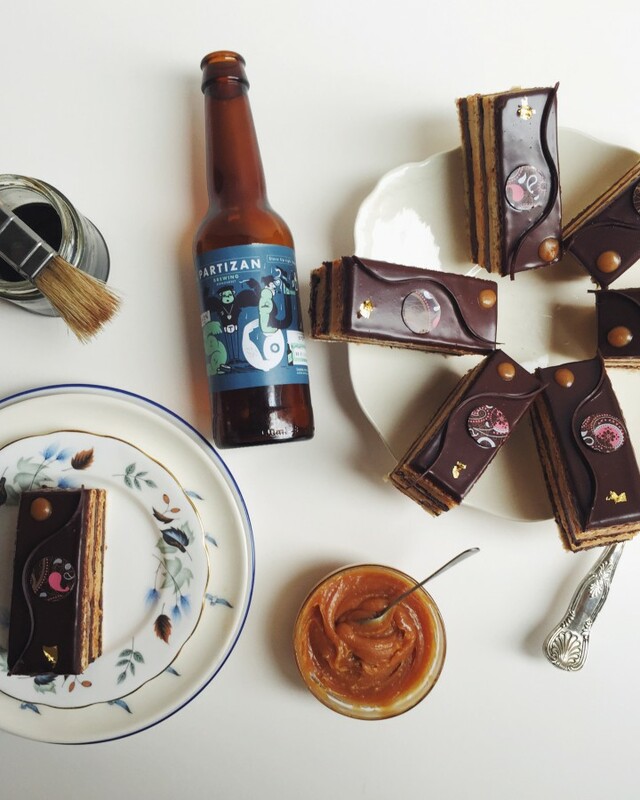 The flavour combination is wonderful, the blackcurrant with the stout really brings out the flavour in the ganache. Thank you for the comments about the layers, coming from an amazing baker like you, that means so much! Thanks Alison. It was worth all the effort you’re completely right! Thanks so much Rebecca. They taste amazing, I had so much fun making these.